This post originally ran on May 14, 2013. Unfortunately, the Wayback Machine did not track the original comments. Where did your last $240.17 go, William Foster? $3, large coffee at Oui Presse. Cream, no sugar, to go. $2.50 plus $0.50 tip. $1, small bag of catnip. $8.48, Chile relleno plate plus one mandarin Jarritos, at a middling but convenient Mexican restaurant. $57.20, two tickets to Jon Lovitz at Helium Comedy Club. $25 each, plus $7.20 “handling fee.” Funny guy! $12, two Mirror Pond Pale Ales. $4.50 each plus $3 tip, to fulfill the two-drink minimum. $50, 90-minute session in a sensory deprivation tank, the following morning. (1) Back in The Billfold’s early youth, Logan posted this bit of asinine piffle. Although I took some liberties with the truth in my email (cats can’t play basketball; they have no regard for rules and systems, and no capacity for delayed gratification), I was in fact looking for a cat to adopt. I visited Stevie B at the Oregon Humane Society, but he was too riddled with health problems for me, still unsettled in a new city and job, and living alone in a studio apartment, to attend to. 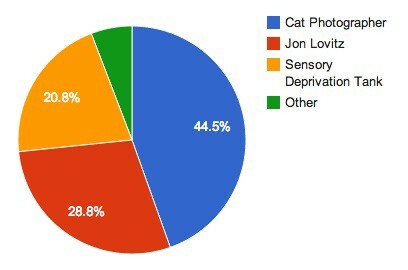 In the comment section [via Wayback Machine], I also expressed interest in a cat named Mr. Biscuit. Mr. Biscuit was clearly a desirable feline, but after my disheartening meeting with Stevie B, I realized that I wasn’t quite ready to adopt. Six months later, though, when I was better situated in my home and job, kitty-cat fever again welled up within me, and by the hand of fate Mr. Biscuit was still available at the adoption center. 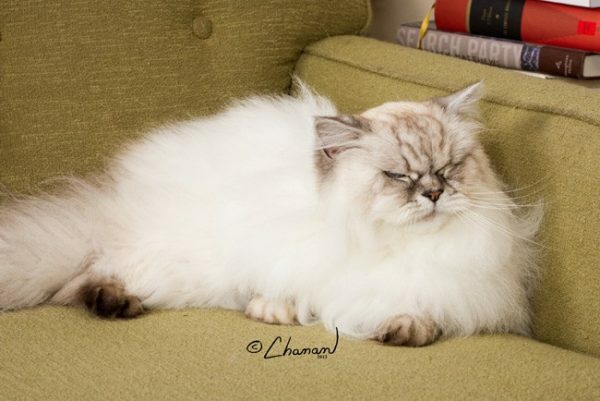 Mr. Biscuit is a 12-year-old, purebred Blue Point Himalayan. He has papers certifying his lineage: “Sire: MR SASSY MIST Dam: CEDES CHOICE CARAMEL.” He’s also a tripod, having lost his rear port side leg to a tumor in 2010. Never in all my cat-fancying dreams did I intend to own anything but a common mutt, but a cat in need is indeed a cat in need, and I took the poor beast under my wing. I bought the salmon in the above line item for Mr. Biscuit’s birthday meal. His twelfth birthday was, incidentally, the day after the events of this post. 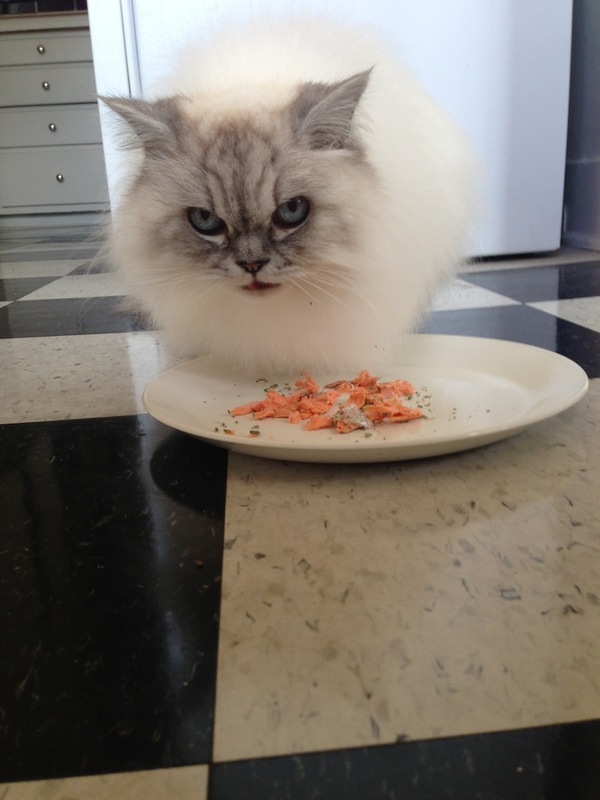 I baked the salmon, garnished his portion with catnip, and ate mine alongside him. (2) Sizzle Pie is convenient to the on-ramp to I-84E, which I took to the Red Lion Hotel at Portland International Airport to pick up Chanan. 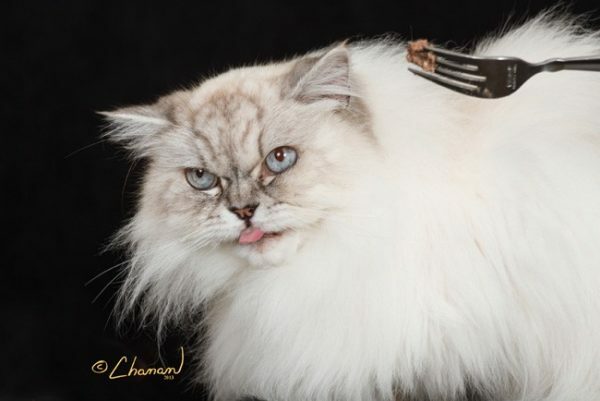 Chanan is arguably the preeminent cat photography team in the country. The name “Chanan” is a roundabout abbreviation and concatenation of the husband-wife duo’s first names, Richard and Nancy. 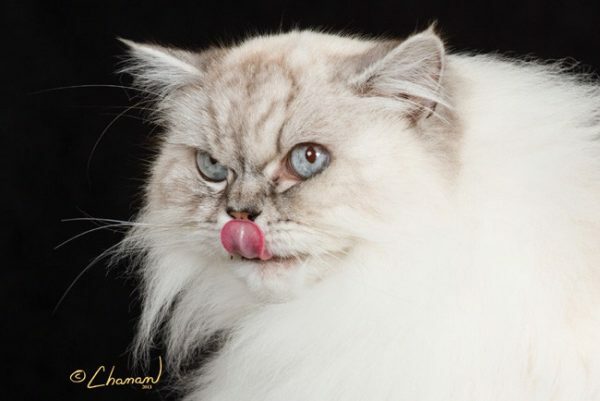 Richard has been photographing cats as his primary occupation since 1976 (his entry into this improbable niche came by way of his mother, an avid cat breeder), and Nancy has assisted him for much of that time. 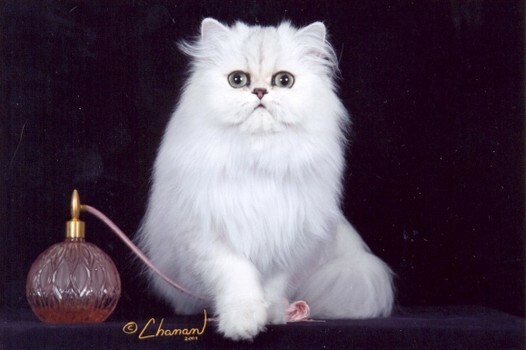 Over the decades, Chanan have cultivated, and established themselves as the principal purveyors of, the favored portraiture aesthetic of cat breeders worldwide. 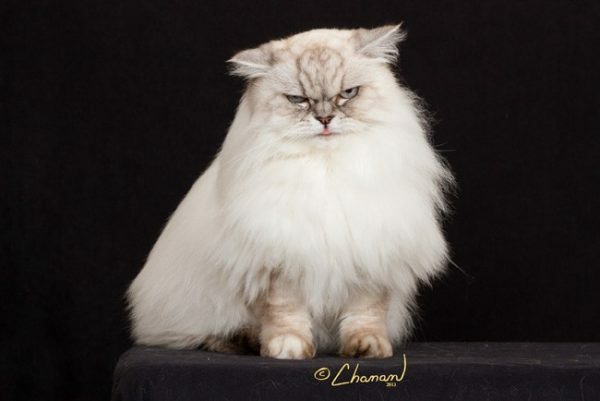 If you’ve ever been to a cat show, you may have seen Chanan in action. They’re almost constantly on the road, traveling to shows around the U.S. and occasionally in Japan and Europe, and their schedule is usually booked over a year in advance. If you’ve ever perused cat breeder web sites, then you’ve probably seen their work, the ubiquity of which testifies to their demand in the breeder community. 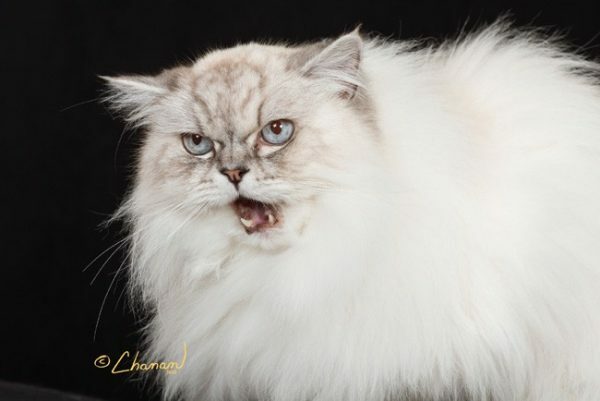 The Cat Fancier’s Association features Chanan’s photos in their online breed profiles, and other cat photographers seem to imitate their style (of course, Chanan’s prominent signature precludes any doubt as to a portrait’s provenance). In this world, Chanan is king of the hill. Chanan’s characteristic style places the subject in front of a jewel tone backdrop, and captures it in a wide-eyed state of alert. 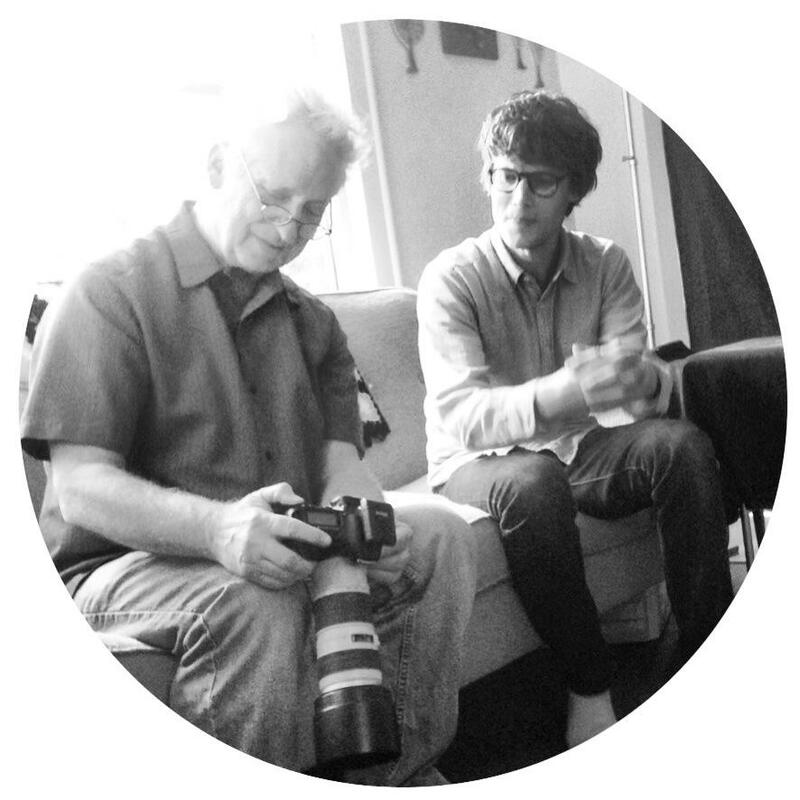 I had seen Chanan’s photos before, but I had never witnessed their process until 2008, when I encountered Richard working solo at the CFA Iams Cat Championship in Madison Square Garden. I watched him for nearly an hour, mesmerized, as he shot three ethereal show cats one after another. His left hand manipulated toys from an extensive arsenal of strings, feathers, and sticks, goading the cats into positions resembling poses, while his right hand snapped photos during the narrow windows of photogenicity. Sometimes he’d ask the owner for assistance (“Pet him again… now stand over there and call his name…”), and occasionally he’d emit a loud, sudden trilling noise to capture a cat’s attention. Eminently professional and efficient, Richard also seemed to maintain a constant sense of amusement about the whole thing, even after more than thirty years in the biz. Breeders comprise the majority of Chanan’s customer base. For them, a Chanan photograph is a practical investment that they use to showcase their animals. But, as advertised on Chanan’s web site, home sessions are available to anyone willing to pay for it. Mr. Biscuit is the first cat I’ve owned as an independent adult, and with him I finally had an opportunity to indulge my longtime fascination with Chanan. I checked their schedule, saw that they were due to be in the Portland area, and emailed them to book a “type (A) session.” Richard replied that he would arrive at PDX at noon on a Friday, and that he was free until the show the following morning. We set the date, and I scheduled the day off from work. When the day came, I arrived at the airport hotel, cheese pizza in my belly, to find Richard sans Nancy. It turned out that he’s been working the show circuit alone since his house was robbed just over a year ago, which he blames on having posted their home address and schedule online. I drove him back to my apartment to set up for the shoot, and he merrily talked cat shop the whole way there. (3) Mr. Biscuit is timid around strangers, and even more so when the stranger is accompanied by a large pile of photography equipment. It took a substantial amount of catnip, treats, and cooing to coax him out from beneath the couch, and even then he refused to cooperate with our agenda. Richard pulled out all his tricks, but to little avail. He relied on me to comfort Mr. Biscuit, but under his close direction: “Pet him… again… Do you have canned food? Go get a can and stand behind me… wait… now open the can… oh! better grab him… give him some food from the can… now put another bite in front of his face, but pull it away NOW… try again… uh oh, go grab him… give him a good petting… let’s try the catnip again,” and so on. William Foster lives in Portland, Oregon.